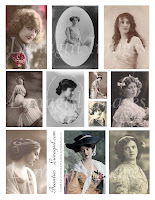 Lunagirl Moonbeams by Lunagirl Vintage Images: More New Collage Sheets! Well, I've been very busy creating a whole bunch of new Lunagirl collage sheet designs -- just in time for all those projects you've been planning. Winter is a great time to settle in with a cup of tea or coffee and get creative! 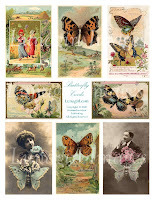 To start, here are some gorgeous butterfly cards from turn-of-the-century France, to remind you of spring. You'll find all Lunagirl collage sheets at Lunagirl.com, ready to purchase and download instantly to print onto your own papers. If you prefer to buy them already printed, just let me know. How about some vintage beauties in soft romantic tones, or some dashing men? Vintage photographs of men can be hard to find, and these are some great ones. 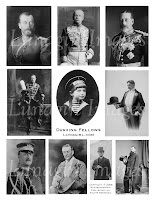 Unique family photographs from the 1900s to 1930s. 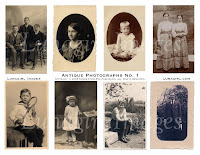 I enjoy restoring and altering these to make them perfect for altered art, and we are pleased to share them in digital form so that the originals need not be damaged when you use them as art supplies! Charming Fairy Collage Sheets - New! Bonne Année - 365 jours de bonheur!